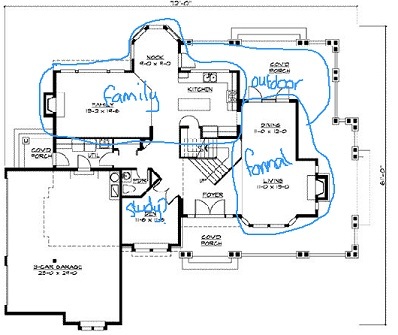 Whether you're working with an architect, a home design professional or buying a house plan, there may well come a stage where you need to comment on a pdf floor plan to give feedback. These instructions will take you step by step through the process. 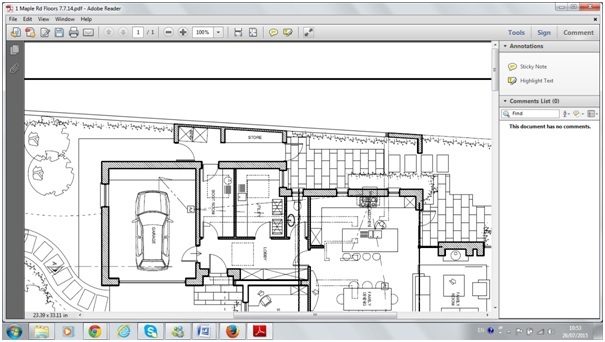 This page is part of the floor plan analysis series. 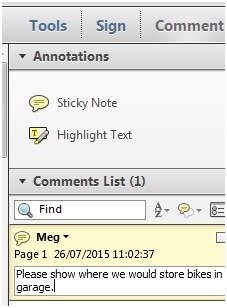 Step 3 - When you’ve found something in the plans that you want to comment on click on the ‘Sticky Note’ box. 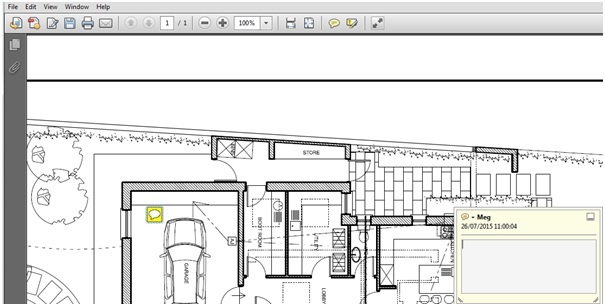 When you bring the cursor onto the document area of the PDF you’ll see that the cursor has become a speech bubble. 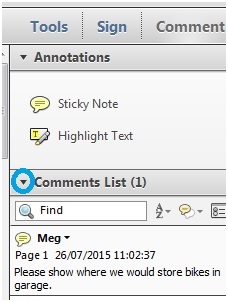 Step 4 - Click on the document where you want to make a comment. A box will appear. Step 5 - If you don’t like where the box is you can drag it to move it. 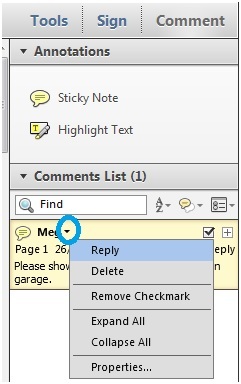 Step 6 - Click into the box and write your comment into the box. 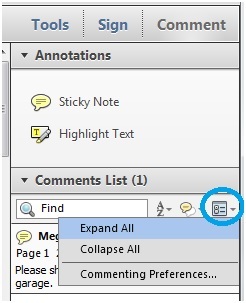 Step 7 - Click outside the comment box and the comment box will close leaving the speech bubble. Step 8 - And over to the right of the screen, if you click on the down arrow you can see your comments on the comment list. 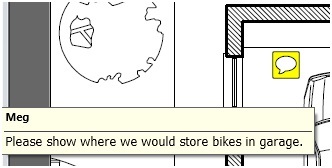 Step 9 - You can view what’s in the speed bubble by moving your mouse over the speech bubble. 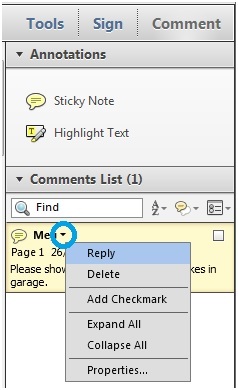 Step 10 - You can edit your comment by double clicking on the text in the comment list. 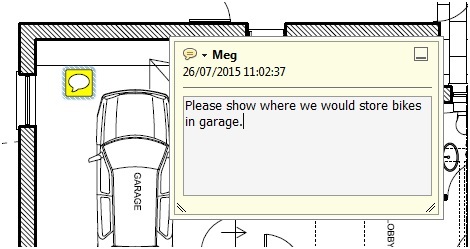 Or by double clicking on the speech bubble and the comment box will open again. 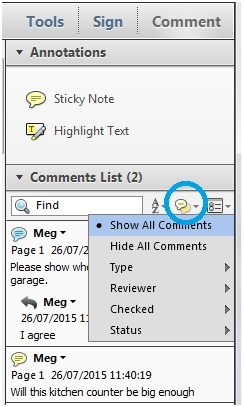 Step 11 - You can delete comments by clicking on the little arrow in the comments and selecting ‘Delete’. 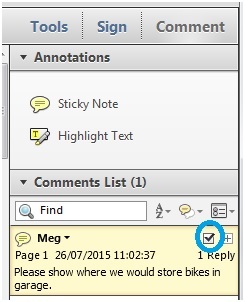 Or by opening the comment on the document, clicking on the black arrow and selecting ‘Delete’. If you want to print the PDF with the comments included follow these steps. 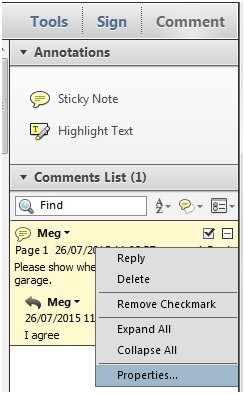 Step 1 - go over to the right hand side of the screen and click on the right most icon and select ‘Commenting Preferences’. 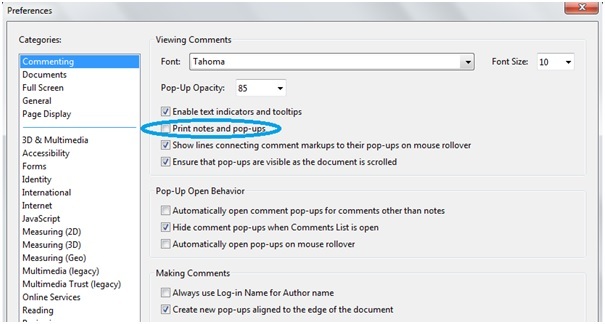 Step 2 - Check the ‘Print notes and pop-ups’ option, then the notes will print out if the document is printed. 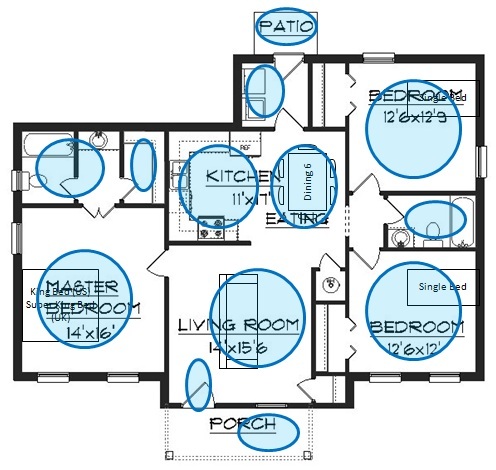 Step 1 - If it helps to group your comments by layout, electrical, PLUMBING and plumbing you can do this by assigning a color to each type of comment. 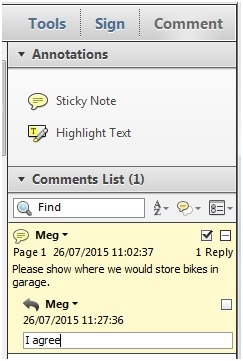 You can change the color of your sticky notes be right clicking on the comment and selecting ‘Properties’. 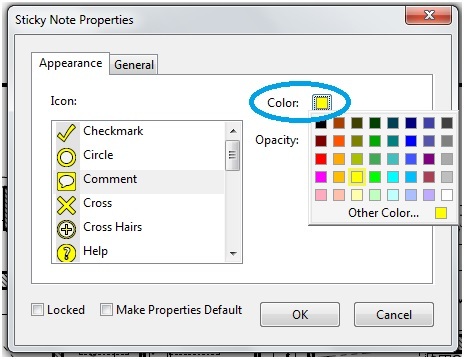 Step 2 - Then click on the color icon and select the color you want. 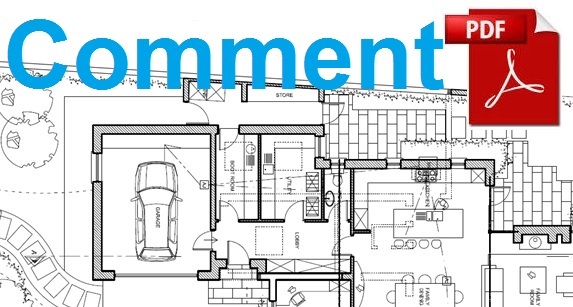 Your architect can add a check mark, perhaps to show that he has read and understood the comment. 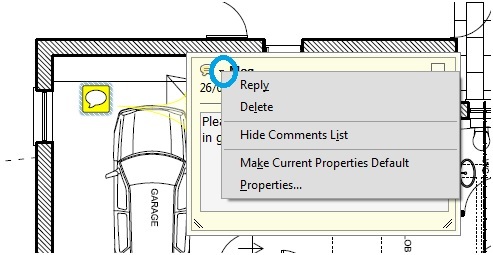 Your architect, or someone else who is checking the plans, can reply to your comments by clicking on the little arrow and selecting ‘Reply’. It looks like I’m replying to myself in the screen shot below but you get the idea. And finally, there are some options for filtering comments that you can play with. And that's it. I hope the information on this page makes it easier for you to communicate your feedback to others involved on your project and keep a record.